Our new State Master has charged me, Maggie Buck and Ted Beebe with Membership Growth in Connecticut. It is our goal to offer thought provoking articles and tips that will have you thinking differently about your Grange and how together we grow. 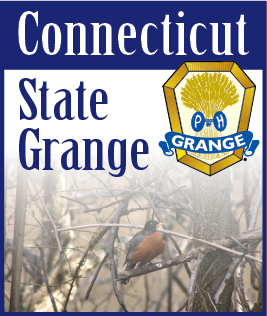 The State Grange cannot change the makeup of the membership in your Grange, sorry, there is no magic wand to be waved or pill that can be taken, but what we can do to help change your course from stagnation and complacency to excitement and growth is to offer a few very simple steps to consider using at one of your next Grange meeting, perhaps as a Lecturer’s Program. Make sure your membership is ready to do a little work, though. Step One: Dream, dream like you did when you were a child; dream larger than life dreams for your Grange. It may seem silly at first, and a bit ridiculous, but it can be fun when you just close your eyes and see what you want to see, what your heart wants to see for your Grange. As you are doing this exercise, write those dreams down, because we will need them for step two. Remember dream BIG. • Build a park for all citizens can enjoy! • 100 new members this year! • Well, you knew I couldn’t write an article and not mention this category, after all if we don’t develop better leadership skills how will we recruit, mentor and develop our 100 new members into Grange Members? Step Three: Go over your list for feasibility. A disco ball would be cool, but disco died a long time ago. A goal of 100 new members may not be realistic, but 5 or 10 this year is. Set goals your current membership can obtain and be careful to not choose too many. Two or three goals should be good for almost every Grange; after all we want to set ourselves up for success. Step Four: Set up teams of energetic and enthusiastic members that can see these dreams becoming reality. Set a time line for each to develop and execute their plan(s). Have each team report at each meeting on their results to date. Make sure you celebrate the successes of each team every month. If a team has made no progress discuss how, as a group, you can get the “plan” back on track. Encourage each member to be part of the process, NEVER, NEVER, NEVER scold, reprimand, criticize or “take over” the plan or team members because it is not going the way you think it should. That is counterproductive and in a complete opposite mindset of collective particpation. Constructive input can be a gift to the team and the process, negative input only builds higher walls and discourages future participation. Step Five: Enjoy your results, have fun at your new activities, enjoy your new members and your Granges renewed positive energy. If any Grange would like to have any member of the Membership Team come and discuss membership growth opportunities, we are only a phone call or email away.